The Union of Professional Nurses and Midwives, Ghana (UPNMG) has expressed readiness to tackle pressing issues affecting professional nurses and midwives in Ghana after successfully party ways with Ghana Registered Nurses and Midwives (GRNMA). The Union after research conducted is introducing some live changing policies to support and progressively improve the living conditions of its members to safeguard their lives and future. These policies include; the Mutual Fund where members would be granted loan facilities, Research, and Scholarship Fund to support members further their education and huge deductions to the GRNMA on their payslips will be a thing of the past are on other policies UPNMG intends to implement in the coming days. The UPNMG in a statement says it also intends to support the government's efforts of making health care accessible to all by investing in clinics and hospitals instead of hostels. “This will not only create employment for the many unemployed Nurses and Midwives in the house but will also make health care accessible and affordable to all,” the stated noted. 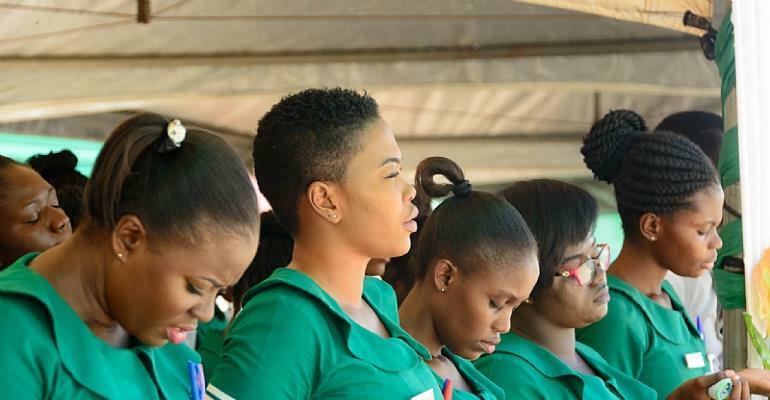 The past few years have seen several agitations from the Nursing and Midwifery front following the lack of support and progressive welfare policies from the Ghana Registered Nurses and Midwives Association (GRNMA). As said by Martin Luther king Jr, Freedom is never voluntarily given by the oppressor; it must be demanded by the oppressed so on the 14th of December, 2017, the fight to form a new Union for Nurses and Midwives begun in earnest with the registration of the Union of Professional Nurses and Midwives, Ghana (UPNMG) at the Registrar General’s Department (RGD) in Tamale. The news spread like wild fire and was greeted with euphoria and merry making by thousands of nurses and midwives across the country who had grown weary of the mammoth deductions on their salaries by the GRNMA. In the ensuing months after the registration at the RGD, leaders held several meetings with the Labour Department to prepare the grounds for registration as a Labour union. Slow as it may have looked back then, UPNMG overcame all the odds to accomplish the arduous task of becoming a labour union breaking the monopoly the GRNMA had enjoyed since 1960. The 14th day of December, 2018 will always remain a joyous day in the life of UPNMG as this was the day the Chief Labour Officer issued to us the all- important Trade Union Certificate. Many are the issues confronting Nurses and Midwives in the country and we intend to tackle them head on to bring some comfort to members to enable them deliver the best of care to their clients. The huge deductions to the GRNMA on our payslips are going to be a thing of the past. Every single deduction will have to be one that members stand to benefit not one that Executives stand to benefit from. The long awaited mutual fund from which members can draw loans and other benefits shall come into being, the housing and auto schemes will be opened for members to take advantage of very soon as plans are far advanced for take-off. The framework for the research and scholarship fund which will help reduce the burden of school fees for members who wish to further their studies is ready and members stand to benefit from it as soon as we take off. As health care givers, we are confronted with many health issues and accidents. It is for this reason we are bringing the group insurance policy for members. This policy will take care of the members as well as some of the immediate family members whenever the need be. With the health of the nation at heart, we intend to compliment Government’s effort of making health care accessible to all by investing in clinics and hospitals instead of hostels. This will not only create employment for the many unemployed Nurses and Midwives in the house but will also make health care accessible and affordable to all. As we await our introductory letter from the Ministry of Health to the Controller and Accountant General’s Department, we entreat our members to stay calm and allow the processes to run smoothly. We understand the eagerness with which we want to stop the name GRNMA from appearing on our payslips and we know how this has led to some people paying huge sums of money to people to do that for them, we are also aware of how Nurses and Midwives are switching Associations from GRNMA to some unions not even related to Nurses nor Midwives. All these show how discontent we are with them, but we will continue to plead with members to remain calm and resolute as we continue to dialogue with the Ministry of Health for the introductory letter. There is hope for every single Nurse and Midwife in the country. The Union of Professional Nurses and Midwives, Ghana (UPNMG) has come to stay with an objective to improve the welfare of members through the mobilization and judicious utilization of our resources. We believe that one way of improving the health care system in the country is to improve on the welfare of the caregivers and we are here to do that. Thank you and God bless all the hard working Nurses and Midwives in the country and beyond.